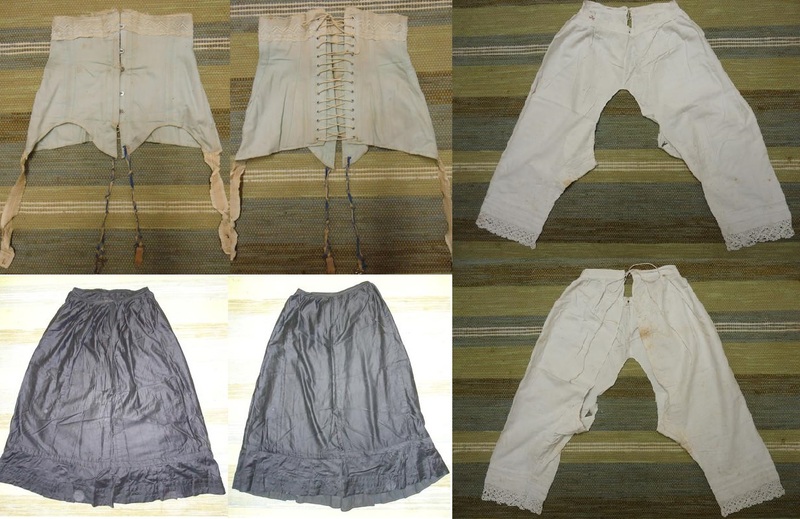 Last year, I received some vintage underpinnings that my parents had found in an old clothes chest, stored in the attic of the family farmhouse. 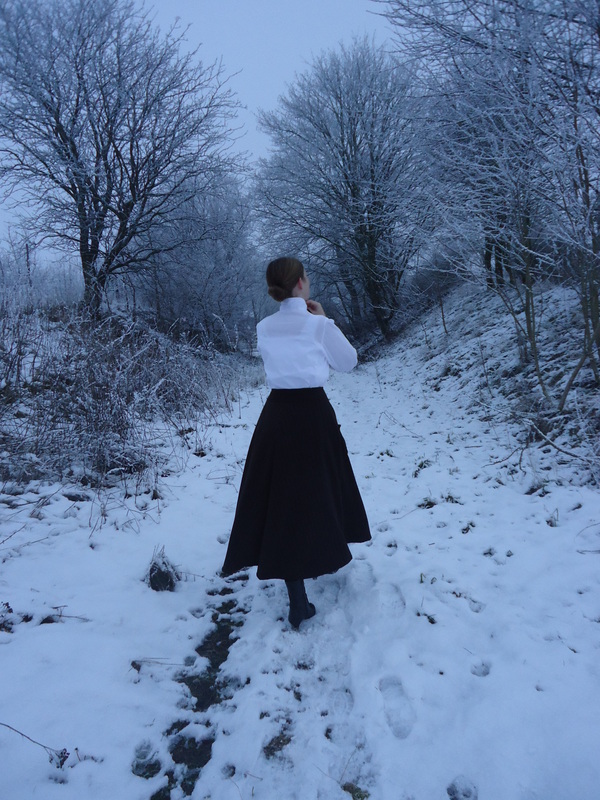 Amongst these clothes, there were a corset, drawers and a petticoat. The same summer, I also got a vintage sewing machine, of the same age, but from my husbands family. When the theme for this competition was announced, I decided to sew clothes matching my heirloom, on my vintage machine. I wanted to create something that might actually have been worn by my relative, who owned these clothes, if she would have had my taste and interests. Further, I wanted to find an occupation for this fictional Edwardian self, where my eagerness to learn could be matched with staying on the farm. 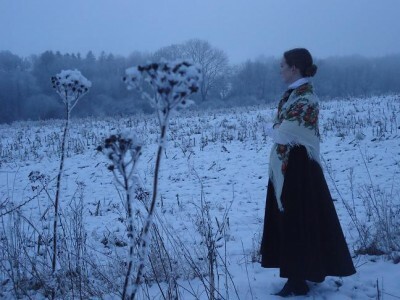 After some research, I decided to go for a country teacher (I have teachers on both of my parents sides of the family), as this was the primary occupation for ambitious Swedish women of the time, who wanted to study and work. As education is the most powerful weapon against war, I consider this as my contribution against the Great War! The original corset, that my parents found in a chest, which had been locked for at least sixty years. Dated to about 1908. I had already sewn a Victorian chemise and drawers, so now I wanted to make something else and decided upon a combination of chemise and drawers (1913). I translated the lovely, expensive versions I had seen at museum pages, into something affordable for a farmer’s daughter. Except for the green ribbon, I solely used inherited materials, from bed sheet and laces removed from pillow cases, down to the thread and buttons. Combination of chemise and drawers – closes with buttons, otherwise open up to the back. When I reconstructed the corset, I used coutil and other material from VenaCavaDesign. The lace reminds of the lace on my vintage drawers. The suspender end grips was a gift from a friend. After having finished the corset and combination, I had no inspiration left for the corset cover and petticoat. Therefore, I made a simple combined corset cover and chemise (1910-12). 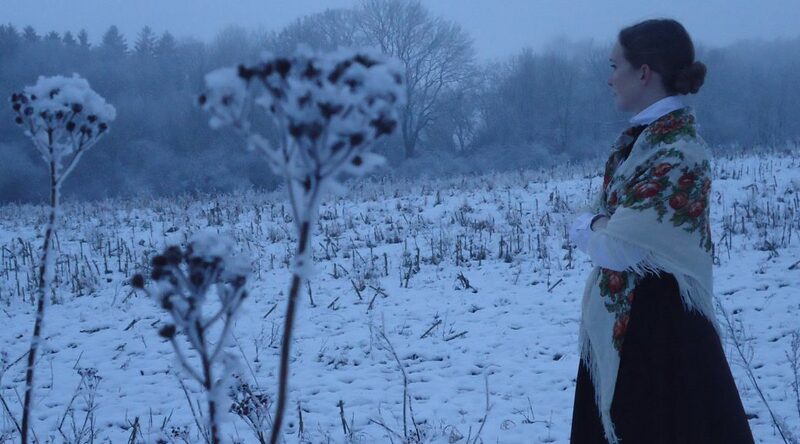 In the picture, I wear the corset cover under my inherited petticoat. Combination of corset cover and chemise. To the right, worn together with my vintage petticoat, from the same clothes chest. Hilda, the owner of the under-pinnings, was born in 1894. 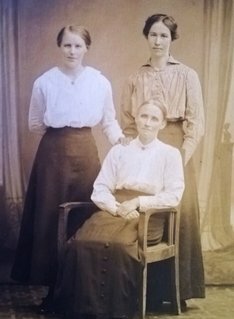 At this photo, from 1915, she stands at the left, together with her older sister and mother Matilda. The income of country teachers was modest. Swedish literature from this time praises the woman who knows how to dress beautifully without following the fashion too anxiously, and who knows how to keep her clothes in a fine condition. Thus, I can confidently argue for combining the differently dated parts of the costume with each other. Unfortunately, I was not able to move the sewing machine to my Danish home, so intsead of historically accurate techniques, I used my modern machine and all its advantages. 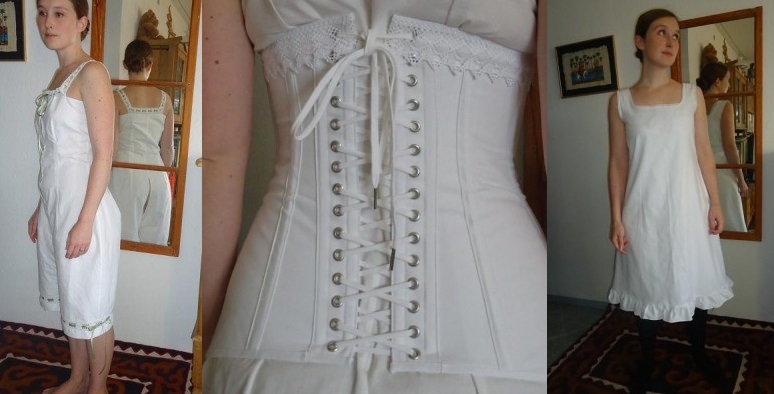 My first project was to recreate the corset, which is supposedly dated to 1908. I ordered the materials needed from England, but forgot the suspender end grips. Last week I received this from a friend, who had inherited them from an old relative. For Sunday wear, my fictional self would wear my previously sewn woollen skirt and machine embroidered cotton blouse (about 1910). This costume (1910) I sew two years ago, but now it was finally complete, with all the right underwear and the beautiful belt, which clasps I also got from a friend. The blouse is made of cotton, with machine embroideries. In the back, the skirt closes with hooks and sewn eyes. The fun part was creating the clothes that the teacher would wear for work. She should look neat and respectable, at the same time as the clothes should be practical and at least a bit modern. 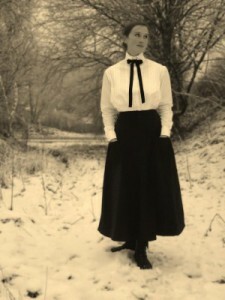 After some research, I decided to sew a shirtwaist with pin tucks (about 1910) to combine with a modern skirt (1914). Three days ago, I was worried that I had failed completely, as my husband looked sceptically at my half finished costume, but when the costume was finally finished, both he and I were pleased to see it was all I had planned for my costume to be. Hej, Den gråa kjolan som du har i detta inlägg har en så vacker bakdel. Finns det möjlighet att du kan dela med dig av denna konstruktion på ett mera detlajerat sätt. Jag skulle så gärna vilja göra något liknande men kommer inte riktigt på hur man ska göra. Tacksam för din återkoppling. Tack så mycket, Margareta! Vad glad jag blir. 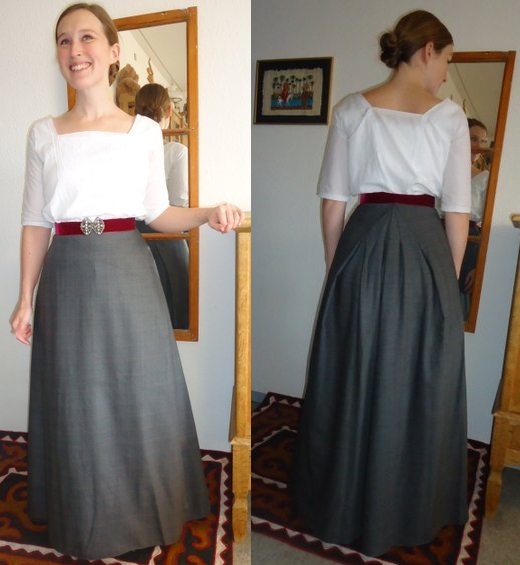 Nu har jag satt ihop ett inlägg om kjolens konstruktion, så här sju år senare: http://blogging.susannaart.se/grey-skirt/ Jag använde inget mönster, utan draperade på provdockan. Det går nog att fixa utan provdocka, men det krävs nog betydligt mera tålamod då. Hoppas att det kan vara till någon hjälp. Lycka till!